Kobe Bryant #24 of the Los Angeles Lakers drives against P.J. Tucker #17 of the Phoenix Suns at Staples Center on December 10, 2013 in Los Angeles, California. Kobe Bryant has anchored the Lakers for 17 seasons now he may really be holding them down, NFL could be short for No Fun League and for some, winter in L.A. just doesn't quite feel right. For more on all of those things we're joined by Andy and Brian Kamenetzky, who have covered sports for ESPN and the L.A.Times. The Lakers have had an interesting last 10 games. They won 6 of 8 and were actually playing very well…until he showed up. Kobe Bryant has played two games, both losses, and it seems like they have lost the spunky style that was starting to emerge. 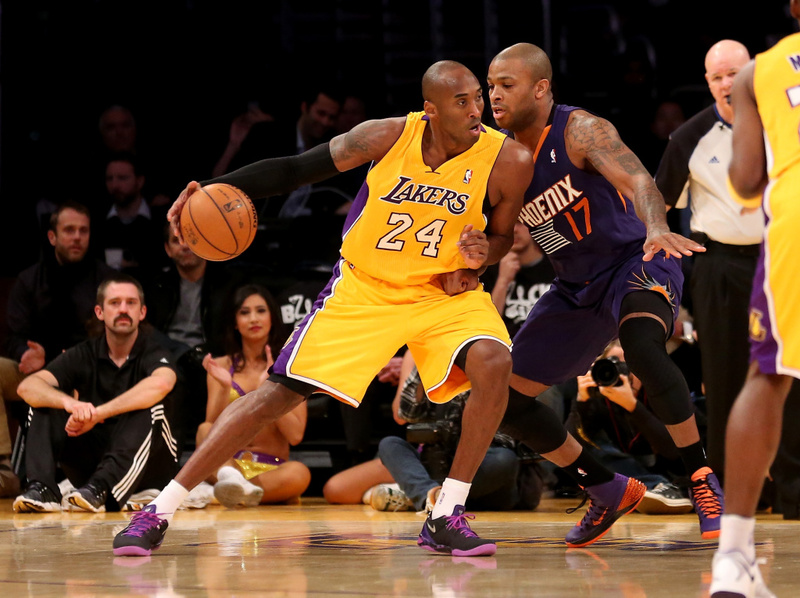 Why does it seem like Kobe Bryant is weighing this team down? The Lakers were keeping their head above water without Kobe and the thought was, "imagine what they'll be like when he gets back." What do Lakers fans have to look forward to for the rest of the season? There was time just a few years ago when we thought that Matt Kemp was going to be the face of the Dodgers franchise. Now, like many other faces in L.A., things have changed. What's going on? Recently, the Seattle Mariners signed former Yankees 2nd baseman Robinson Cano to a 10-year, $240 million contract. What's the world coming to when the Yankees can be outspent? A new study on the effects of playing football may contradict a lot of what we think is pretty much a given when it comes to head injuries. While it seems like there might be a debate on what causes CTE, the one thing that hasn't changed in the NFL is getting hit in the head. This season the Super Bowl will played outdoors in New Jersey on February 2. The highest temperature in same date last year was 30 degrees. Now the NFL is cracking down on two things that could help fans warm up.